Anyone looking for home electronics knows that big-box resellers tend to dominate the retail landscape, given easy accessibility and hands-on shopping experiences. Unfortunately, the rise of big-box retail has also ushered in the gradual demise of audio specialists — you know, the local dealer or sales associate who truly consults with customers to help meet their needs. But on a positive note, custom installers and system integrators, specializing in complex AV installations and/or multi-room audio systems, have helped to fill the void of audio specialists. Although they perform services for a cost, you're typically guaranteed the best advice and customization. Manufacturers sometimes create quality audio products available only through custom installers, so they're certainly worth the consultation. So in this context, we present the Episode 500 Series LCR-4 speakers. SnapAV, a custom installation specialist located in Charlotte, NC, founded Episode in 2005 to serve the growing custom installation market. Episode offers a broad line of bookshelf and architectural speakers that are available exclusively through AV installers and custom integrators. You won't find Episode products in big-box stores, and you probably won't find a speaker system with as much value as the Episode LCR-4. The Episode 500 Series LCR-4 is a two-way compact speaker featuring two 4.5" polypropylene injection cones with high-temp voice coils and a 1" Titanium dome tweeter, all of which is housed in a compact, stylish enclosure. Whether you choose the black or white colorway, the high-quality glass-like finish is immediately noticeable. The LCR-4 speakers are a bass reflex design, with two ports on the back of the enclosures along with gold-plated 5-way binding post speaker connectors. Each speaker comes with wall-mounting brackets that place the speaker about 3/4" off the wall when installed. 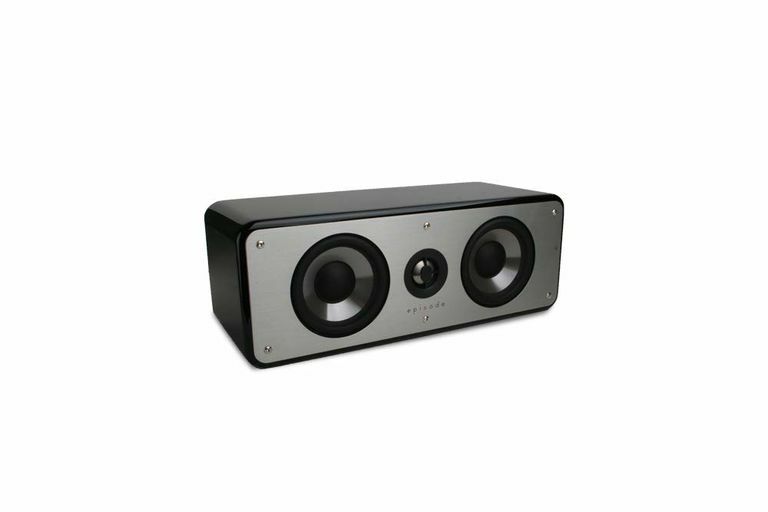 These are well suited for use as a speaker system to accompany a flat panel television and can be easily installed vertically or horizontally. We tested five of the Episode 500 Series LCR-4 speakers together in a system with an Episode 12" in-room subwoofer (the company also offers an in-wall subwoofer). Although some may consider it a steep challenge for compact-sized speakers, we placed the Episodes so that they flanked a 96" video screen rather than a flat panel television. The left and right channel front speakers were positioned next to the screen, and the center channel speaker was set just below the screen. Despite having a small footprint, the Episode 500 Series LCR-4 speakers delivered surprisingly big sound as we enjoyed the soundtrack of the movie, "The Wrestler" (2008, Blu-ray, Wild Bunch Pictures). The body slams, head crunches, and other unpleasant activities seen in professional wrestling sounded all too real to us. It was difficult not to wince when watching these guys on the screen — quite likely a major part of the appeal of the 'sport.' The Episode LCR-4 speakers easily handled the vast dynamic range, and all the movie dialogue sounded intelligible throughout. We also played music on the speakers, plucking out choice examples from our favorite test tracks. Diana Krall's breathy rendition of "How Insensitive" (Verve Records) — a more genteel stereo music sound test — revealed excellent vocal detail with very good center imaging. Jennifer Warnes' "Bird on a Wire" (Porch Light, LLC) began with deep, robust drums and percussion, showing how well the Episode speakers blended seamlessly with the subwoofer. The sound qualities of the Episode 500 Series LCR-4s were similar, no matter when placed in a vertical or horizontal position. In terms of the overall timbre, the Episode speaker system sounded very neutral with both music and speech. Affordably priced, the Episode 500 Series LCR-4 speakers make for an excellent choice, especially when complementing a flat panel television. You can even pair them with a video projection screen if that's your preferred set-up. They're so good a value that your local big-box retailer would probably prefer you didn't know about them. These speakers sound fantastic with music sources but showcase their true strength with movie and television sound. Build quality, fit and finish, and style is both eye-catching and impressive, whether wall-mounted to flank screens (with the included mounting hardware) or not. You won't find the Episode 500 Series LCR-4 speakers at your local stores, but you can find them online and/or through a local Episode reseller. Dimensions (W x H x D): 5.1", 13.8", 6.0"